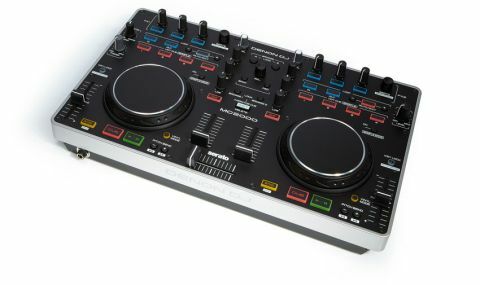 The MC2000 is robust enough for DJ travels and so simple to use beginners will get it straight off. Solid build. Competitively priced. Simple to use. Bundled software is quite limited. The entry level controller market is fast becoming a crowded place. With so many vying for your attention, wouldn't it be nice to have a definitive 'best of the bunch'? You know, one that digital DJs can trust to handle their performance needs at the right price too? People, in the Denon MC200, we may have found that controller! The Denon MC200 is a two-channel digital DJing hardware unit bundled with, and tested on, Serato's DJ Intro software - MIDI-mapping also allows it to run on other platforms like Traktor and Virtual DJ. "The first noticeable feature is how sturdy this thing is, both in terms of weight and design"
The first noticeable feature is how sturdy this thing is, both in terms of weight and design. Its metal casing and resilient knobs and faders are designed to take the kind of knocks an item routinely lugged about on DJ travels is prone to. As for the uncluttered layout, the vitals are in the places you'd imagine: left and right sides house pitch, cross and line faders, hot/sample cues and loop buttons with FX dials spread above. Unbalanced RCA in, mic input and the RCA line out are round the back. A 1/4" headphone jack is on the front. The pressure sensitive jog wheel platters are solid as a rock and feel responsive beneath your fingers. Line and pitch faders offer more resistance than some other controllers, which is sure to help withstand accidental nudges. The cross fader, on the other hand, is quick and loose with a tight curve of up to three mm (adjustable in DJ Into's setup). Other performance adjustments are handled by the various rotary knobs on the unit. These are sturdy and the ones that require it have a centre click. They're also quite tall, making them easy to find in the heat of a mix. The four cue buttons are hard plastic and responsive, recognising your actions immediately. Sync and Key Lock buttons take pressure off the mixing part and let you get on with blending your beats, while the bank of FX across the top of the controller offer the usual range of delays and filters. "It's intuitive and simple to navigate with a feature set that packs in what you need without gimmicks"
Spec aside, the MC2000 just works. It's intuitive and simple to navigate with a feature set that packs in what you need without gimmicks or button claustrophobia. Its main rivals at the moment include Pioneer's DDJ-WeGo, Novation's Twitch, and the Vestax Spin 2, but the MC2000 is a clearer, simpler, and stronger sounding device. The only gripes come from the excellent yet limited DJ Intro software. The lack of a recording function, boring one to eight bar looping and a lack of post-fade effects can all be addressed by upgrading to the full fat Serato DJ software... For a price, naturally. As for the hardware, we would like to have seen line meters chugging away for a visual volume reference but auto gain has done away with that need these days. The Denon MC2000 is playable, fun, sturdy and more robust in sound and design than any other controller hovering around its price range (and a few above). It's a must for newcomers and podcasters, and will prove essential for warm up, house party, bedroom and bar DJs. If you're in the market and on a budget, be sure to make this your first port of call.